Below: A whalebone plaque I made for my late husband. ​Have you ever been drawn to a picture not knowing why you felt a deep connection with it? The whalebone entrance leading down the pathway to a house, on the Isle of Lewis, did that for me. I was mesmerized by it and felt the need to find out more about it. I had contacted my cousins on the Isle of Lewis, The photo was well known but no one could give me any answers to the whalebone archway. Then I was contacted by my cousins, Christine and Agnes asking if I could help with the family history as a person had contacted them, her name was Doreen, during her ancestor tracing she had found a connection to us, and wanted to know if we could help with the family tree. I contacted Doreen, and we became friends on FB, and we started sharing our family history with each other. 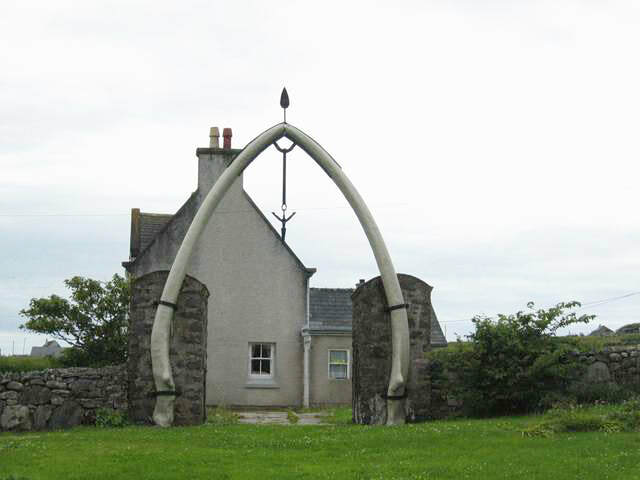 That was when I found why I felt such a connection to the photo, I was related to this Murdo Morrison who had found the whalebone and it took a village to help bring it to his place where he placed it as the archway, even today it is still a tourist attraction, lots come and take photos of this whalebone archway. Now I have the story of how this all came about and will share it with you. The year was 1920 and some village boys were fishing and spotted a shiny object gleaming in the sun out at sea. They finished fishing and when they went home the shiny object was still bobbing up and down, they decided it was an overturned boat. ​The next morning the tide had washed it ashore. This shiny object was an 80-foot whale that the tide had brought in. attached to it was a harpoon stuck in it with a long rope trailing from it. ​After a careful examination, there was no clue as to where it would have come from. This was not the first time a dead whale had been brought ashore by the tide. It was common for the cove of Geodha Nam Muc. This dead whale could not stay where it had washed ashore so they got two small boats to pull it around the headland to Bragar Bay. ​The winds carried the odour to the village was more than unpleasant and also some ended up with choking problems. There was fear of a disease could happen as the fumes were floating in the air. ​It was then that they decided to cut the whale up. The blubber from the whale is a thick layer of vascularized adipose tissue under the skin of the whale. It contains Omega 3 fatty acids and vitamin D. Although back then I doubt if that was a well-known fact. The blubber was put to a great number of uses. They only had to stick a knife into it to get the oil out. ​Because of the size of the whale, it is suspected that they got at least 3 tons of oil. The oil was used for candles and in oil lamps and fuel for heating, soap and in making margarine. Also disinfectant for humans in medicine, and as a disinfectant used for sheep dipping back then. All in high demand, the oil went all around the district, very much in demand. Since the 21st Century with most countries having banned whaling the sale of oil has virtually ceased. It took a whole year for the whale to become a skeleton. Murdo Morrison had been the spokesperson on behalf of the villagers on the disposal of the whale. He was also the Postmaster and the general merchant. He decided the whalebone would make a lovely arch over his gateway at Lakefield, Bragar. He got two horses and many men from the village to haul the bones on a sledge up to his house. He then hired a skilled ironmaker from Stornoway to join the bones as they were starting to come apart. As the photo shows the harpoon which was accidentally discharged during cleaning and landed in the barn was suspended in the middle of the arch. ​The accidental discharge proved that the whale had not died instantly but had a slow painful death because the harpoon had not discharged inside of it. It might be a whale, but that is sad to think that it suffered a long and slow death. No one knew how all of this happened and how long that the whale had been floating in the Ocean. A mystery also where it came from that will never be solved. This famous archway with the whale's jawbone stands 25' tall. Over the years the arch has been collapsing, as some people being how they are, try and nick a few bones for souvenirs. It has now been coated in fibreglass for protection. ​So now you have the story of the whalebone arch and I have a found the connection that I am related to the Morrison's. Not only that I have found another wonderful cousin from the Isle of Lewis. Who knows what other gems will be found now? ​See the photo above. I was able to carry it up to the house all by myself, no horses or villagers were needed for me to do that. Due to the severe winters that we experience here, I have it inside the house. I wrote the following saying on mine, as I made it a memorial plaque for my late husband. "The sun is merely hidden for a time, obscured from view, and so your loved one's spirit will still be there with you." I also glued seashells on it and some feathers, that might sound odd, but feathers is a sign of faith and strength. Where I live we have whales and lots of other marine sea mammals in the Bay of Chaleur. It is not unusual to see them. I doubt very much that I will find anything as big as the one on the Lewis Island. ​Living here I am always looking for and finding treasures like this. I know in my heart every treasure has a story. The story, like all treasures, is buried somewhere waiting to be unearthed. My cousin Doreen also informed me that we have writers, poets and singers, in our lineage. it is getting more and more interesting to find my ancestors. The writer writes in Scottish Gaelic only. The poet is dead now, but he wrote Gaelic poems and they have been put to music and are beautiful to listen to as well. As for the singers, we have a few of them; that is wonderful, I also have three Grandsons who sing, two are in a band. Now I know where they inherited it from. ​Why did I not inherit the singing vocal chords as well? I cannot hold a note and be always told at school to mime the words only as I was putting everybody off with my loud vocals that I thought were perfect.